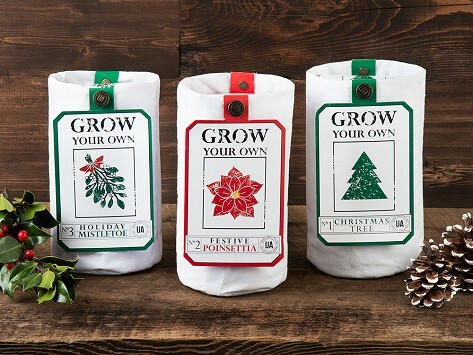 Urban Agriculture’s organic holiday plant growing kits use high-quality organic soil and special seeds that grow well in small spaces. Whether it’s on your balcony or in a snow-filled window, you can always have some holiday cheer with a mistletoe, poinsettia, or Christmas tree plant of your own. Dimensions: 8" x 4.5" x 5"
Who says you need a yard to have a garden? Organic plant growing kits from Urban Agriculture are designed for small spaces, so you can grow beautiful flowers and herbs on a balcony or windowsill. Founder Chad Corzine wanted to grow his own organic produce, but having a tiny LA apartment made it difficult. He found that growing kits were low quality—the peat disks just didn’t have the nutrients the seeds needed. So he decided to make something better. Urban Agriculture gives you the right soil, seeds, and container to grow like a pro. The organic potting soil (instead of peat) has all the nutrients needed, and the special hybrid seeds are designed to grow in tight spaces. And the containers are as beautiful as they are sustainable—made from recycled tea sacks from India, each earthy container is unique. They’re shaped deep to keep soil aerated and well-drained while letting strong roots take hold. Grow your own flowers and herbs, even without a yard. With an Urban Agriculture growing kit, all you need is a little space and a lot of sun.